One of my pet peeves from within the real estate community relates to how many individuals wrongly calculate and report real estate appreciation. They look at the difference in average home prices (not values) over time and correlate the change to rising and falling home values. As I have proven in multiple articles in the past, this produces erroneous results. 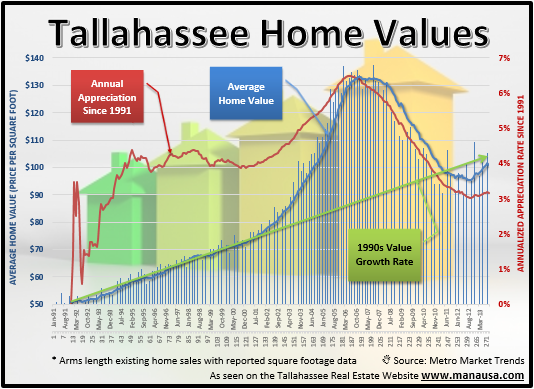 However, there is a way that we can closely estimate the true real estate appreciation rate in Tallahassee, all we have to do is focus on home values. First things first. Most sources would define appreciation as an increase in the value of an asset over time, thus real estate appreciation is the increase in the value of "homes" or "land" or "buildings" over time. These are different classes of assets, and thus they must be measured separately. For the purpose of today's article, I will be looking to determine the appreciation rate for homes in Tallahassee (using condominiums, townhouses, and single family detached homes). Would you be surprised to discover that the annual appreciation rate for a house in Tallahassee, from the beginning of 1991 through September of 2013, is right at 3.15%? That's right, even with the housing market boom and subsequent bust, homes have appreciated at an annual rate of just over three percent. The graph above provides home sellers and home buyers a lot of information to consume. The vertical blue bars, measured on the left vertical axis, are the monthly recordings of the average price per square foot for existing (resales) arms length home sales from January 1991 through September 2013. The blue line shows the one-year average of those values, starting at $50 per square foot in 1991 an ending at $101 per square foot last month. The red line measures the annual appreciation rate from every point looking back to January 1991, and is recorded on the right vertical axis as a percentage. So if you had purchased a home in January of 1991 and sold it last month, you would have recorded a 3.15% annual appreciation rate. Of course, had you sold that house in May of 2006, you would have recorded a 6.49% annual rate of growth. Finally, the green arrow on the graph shows a continuous growth rate in home values based upon the growth rate in the 1990s. 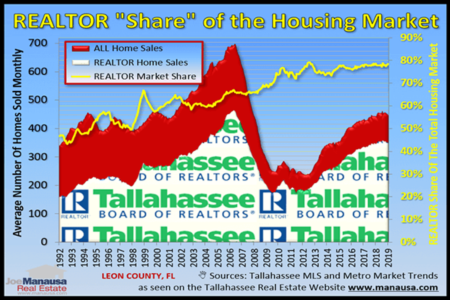 It is a projection of where we would expect to be had there not been a boom-bubble-bust in the Tallahassee real estate market. Based upon this non-scientific regression to the mean, the home value correction appears to be on track. Current home values are below that "expected value" and will likely rise (on average) above the green line in the near term. As a home owner, you should be happy to see real estate appreciation returning to the market. But you also need to realize that supply and demand ultimately determine whether or not YOUR HOME is appreciating or depreciating. If you own a $160,000 in Northeast Tallahassee, you are appreciating at a rate higher than 3.15% right now. Of course, if you own a $600,000 home anywhere in Tallahassee, your home is depreciating due to the glut of homes for sale that will compete with yours. 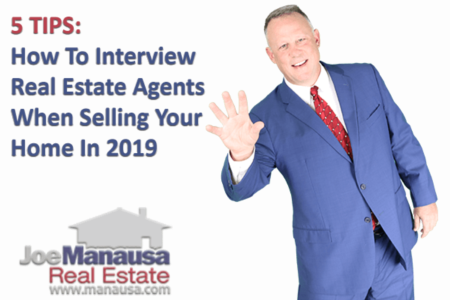 So the key is to understand what your specific market (the market for your individual home) looks like, and what you need to do to be competitive enough to attract buyers to your home. If you would like to know more about real estate appreciation for your home, just drop me a note and we can schedule a time to examine your home and what you can expect to receive were you to put it up for sale in the Tallahassee real estate market.